Sounds of a drum, cymbals and gongs pierce the air in Meru Valley Resort, the residents and members knew the lion dancers were performing. Excitedly, the crowd decked out in new clothes of red hues flood into the lobby of the clubhouse to catch a glimpse of the performers in lion costume wagging the lion’s head and tail as they pranced around the clubhouse. It was performed by Persatuan Tarian Naga & Singa Chiau Hooi Bee, Kuala Kangsar. 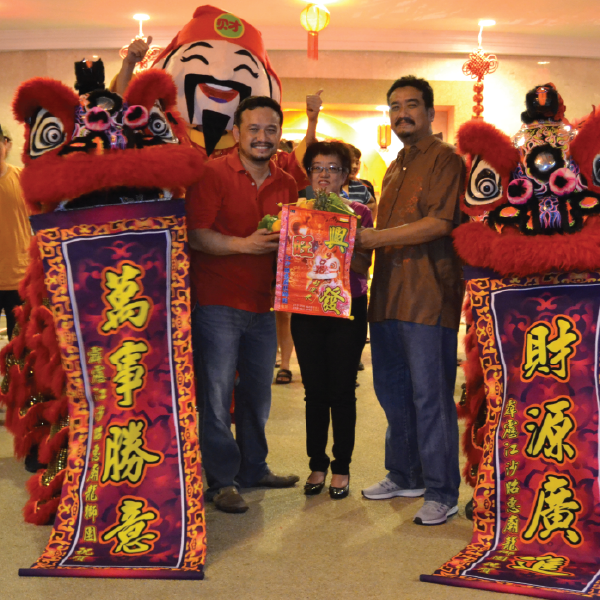 This year, the celebration was made merrier with the performance of Northern Lion and the Neon Dragon Dance. The Northern Lion performed in pairs resembling Pekingese or Fu Dogs in North China, featuring thrilling acrobatic stunts like lifts or balancing the giant ball. Following the Southern lions was the God of Prosperity and the ‘Fu’, ’Lu’, ‘Shou’ who are the Chinese Three Star Gods of happiness, prosperity, and longevity; were giving away oranges to the crowd. The festive mood was further enhanced by the thundering drums and power packed percussive performance of the same society at the swimming pool deck. The night event was made memorable with the one of most iconic performances of the night was the Neon Dragon Dance which took place in #18 of the golf course. A bright blue neon light shone from the forehead of the dragon as bright fire-red ears flopped back and forth and googly dragon eyes blink and fluttered. Intricate wavy dragon scales and feathers resembled the elegance of the dragon and the passionate fierceness of the celebratory dragon dance. Grace and strength shown through as the dragon dancers performed acrobatic moves and body positioning. The event drew hundreds of people from children to seniors. The young ones received blessings with gifts of ‘hongbao’ (red packets with money) as a symbol of luck from the directors of the resort. The lively affair was aimed to strengthen the relationship between people of different ethnic groups by bringing them together.